It is pleasing to report that access to some of our most popular rivers is being improved. DPI, working with the GBCMA and the Department of Sustainability and Environment, has arranged for the manufacture and installation of four pedestrian stiles. These stiles, which will be installed in time for the new season opening in September, are to be placed over fences on the Rubicon and Goulburn Rivers to provide easier access for anglers. 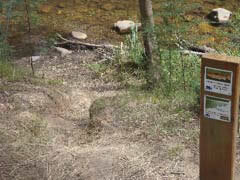 Three are being erected on the Rubicon River upstream from Tumbling Waters and one on the Goulburn River just upstream from Thornton near the ‘Thornton Beach’ area. 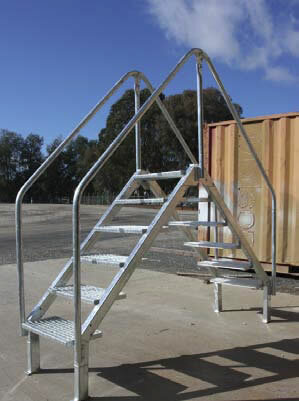 These stiles are very sturdy and solid, having been designed, engineered and constructed to conform with the relevant Australian Standard. Several have already been installed at a number of locations in NSW, and the four to be installed at Thornton are viewed by Fisheries as a pilot project. If they prove popular with anglers, as they undoubtedly will, then it is likely that more will be provided, in which case it has been proposed that the ATF be involved in the oversight of any further installations. In late 2010 and again in 2011 large numbers of brown and rainbow trout were released into Victorian lakes and reservoirs to restock waters that had suffered badly in the drought. The ATF was involved in this work, and Stuart Rees, Stocking Manager for the ATF, organised the stocking of 10,000 trout into Hepburn Lagoon. In the year that followed Hepburn provided some brilliant fishing, and this continues. Those stocked fish have grown, and recent reports tell us that monster brown trout, with sizes from 5 – 7 lb, are being caught. So trophy fish are again being caught in this fabulous fishery. Parks Victoria, the Department of Environment and Primary Industries (DEPI), Arthur Rylah Institute (ARI), West Gippsland Catchment Management Authority (WGCMA), VRfish and the Australian Trout Foundation recently worked together on a project to install barriers and thus protect the only known habitat of the Shaw Galaxias, a rare alpine fish that was in danger of extinction. ARI Fish Ecologist Dr Tarmo Raadik indicated that the Shaw Galaxias lives at the top of a small creek in the upper reaches of the Macalister River Catchment in the Alpine National Park. Unfortunately severe storms and floods in 2010 and 2011 had a big impact on their habitat and exposed the fish to aquatic predators, including trout, that quickly reduced the distribution of Shaw Galaxias to only a 300 metre long reach of a 0.3 metre wide creek. So immediate action had to taken to prevent the extinction of the species. The Shaw Galaxias is a newly discovered small native freshwater fish. Its global distribution is restricted to a very short headwater section of Shaw Creek at an elevation of 1500 m in the upper reaches of the Caledonia River in the Macalister River system. Significantly, Shaw Galaxias is one of only a few native fish that are endemic to Victoria, and is the only native fish recorded from above 800 m in elevation in the Macalister River system in the Alpine National Park. By the 1960s the distribution of Shaw Galaxias was restricted to approximately 4 km of stream, and in 2007 a healthy population of Shaw Galaxias still existed upstream of a small natural waterfall in ‘The Gorge’, which formed a barrier to upstream colonization by predators. However those severe storms and floods between September 2010 and March 2011 altered the structure of this barrier, and hence by May 2012 the galaxiid population had been dramatically reduced in abundance and distribution to a small number of young fish in one side tributary, occupying an area approximately 300 m long and 0.3 m wide. In response, temporary barriers were installed in the creek to protect the tiny remaining area where the Shaw Galaxias is now found. To make sure the fish aren’t placed at risk by future floods a permanent predator barrier was also constructed further down the creek. This will not affect the valuable recreational salmonid fishery that exists further downstream. While the ATF is clearly principally concerned with protecting and promoting trout, it recognises the importance of preserving endangered species such as the Shaw Galaxias, and was pleased to be involved in this project. 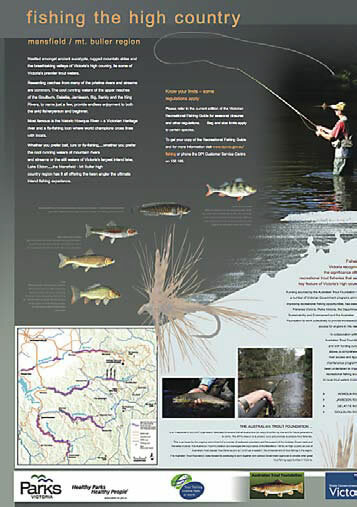 “Victoria’s North East high country rivers have constantly proven to be a haven for both the experienced and the novice trout fisherman. 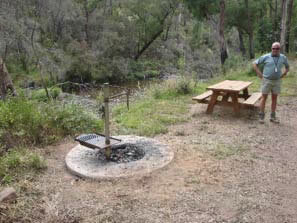 Over the past five years the Australian Trout Foundation, through funding from the Victorian Government’s Recreational Fishing Initiative and in conjunction with Fisheries Victoria and the Department of Sustainability and Environment Forests Management, has worked hard to improve fishing access to a number of these rivers and provide enhanced camping facilities for recreational anglers and other bush users to experience.